Powers/Abilities: Intramuscular polycarbon armour (bullet-proof skin), hardened "Super Axon" central nervous system (ehancing reflexes), advanced "self-scrubbing" respiratory system immune to all forms of chemical attack, nictitating "third eyelid" membrane. 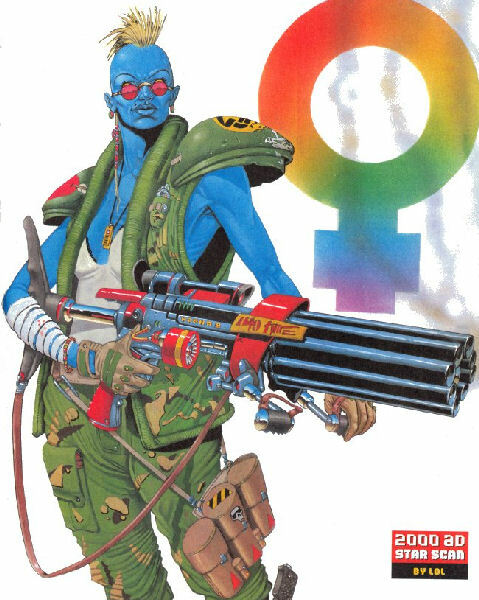 History: Venus Bluegenes was grown by the scientists of the Souther army in a satellite orbiting the warring world of Nu Earth, designed like her masculine fellows, to be a combat machine capable of walking across the gas poisoned surface of the planet without requiring the expensive and constrictive survival suits normal troopers needed. While the male G.I.s were sent into combat on the planet the females stayed on the satellite doing administrative jobs. After almost all the male G.I.s were killed in a massacre, the sole survivor went Rogue. He eventually made it back to the satellite to report that one of the generals based there was a traitor who had sold the Infantrymen out. The traitor sabotaged the orbiting base, causing it to fall from orbit. 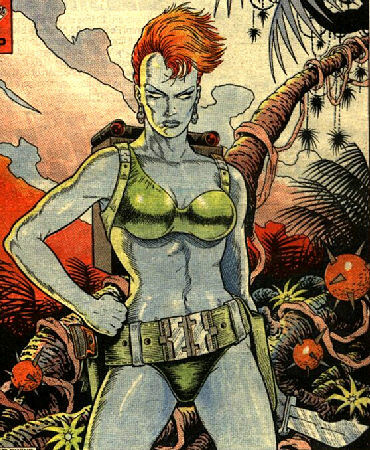 Venus survived the evacuation to the planet's surface, and became a wanderer, occasionally working for hire or trading her skills for supplies and transport. Comments: Thanks to Austin Kornelsen for corrections.